I was born and raised in Derry, Northern Ireland. (Most people know Derry from the U2 song, "Sunday Bloody Sunday"). My dream and focus growing up was to get a woodworking apprenticeship with one of the two top companies in Northern Ireland. I got into JJ Higgins' in June, 1979. My learning, discovery (and obsession) with woodwork grew from there. A five year apprenticeship taught me more time was needed working beside more high caliber woodworkers. I got to fulfill that dream when I moved to America in 1987.
company that built cabinetry for multi million dollar private jets . 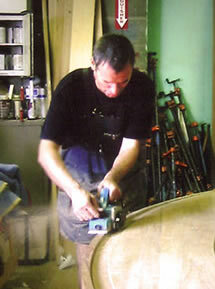 In 1999 I started my own business, McKeown Design, doing custom woodwork and cabinetry with an emphasis on unique design.